Austin Horn Classics Bellissimo Neck Roll Pillow, 6" x 20"
Austin Horn ClassicsBellissimo Neck Roll Pillow, 6" x 20"
Pillow made of polyester/rayon and polyester. EXCLUSIVELY AT NEIMAN MARCUS Boudoir pillow with small cord top and bottom. Tassel fringe sides. Solid linen back. Polyester/viscose. 12"
EXCLUSIVELY AT NEIMAN MARCUS Boudoir pillow with small cord top and bottom. Tassel fringe sides. Solid linen back. Polyester/viscose. 12" x 24". Spot clean. Made in the USA of imported materials. EXCLUSIVELY AT NEIMAN MARCUS Neck roll with silk insets and velvet ends. Grecian knot ends. 6"Dia x 28"W. Polyester. Spot clean. Made in the USA of imported materials. EXCLUSIVELY AT NEIMAN MARCUS Striped neck roll with solid welt cord and button ends. Polyester/viscose. Spot clean. 6"Dia. x 20"L.
EXCLUSIVELY AT NEIMAN MARCUS Striped neck roll with solid welt cord and button ends. Polyester/viscose. Spot clean. 6"Dia. x 20"L. Made in the USA of imported materials. 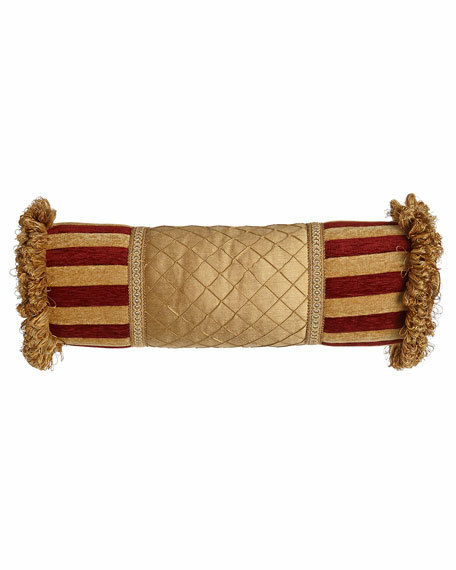 Dian Austin Couture Home Camilla Pillow, 19"Sq. Gimp detail; damask center; cord edge. Polyester/cotton/rayon front. Cotton/polyester back. Polyester fill. 19"Sq. Dry clean. Made in the USA of imported materials.